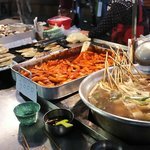 South Korea is becoming one of the most popular touristic destinations. Visited mostly by tourists from Japan, China and Taiwan, in 2013 Korea had over 12 million of international tourists. People come here to visit the historic sites, enjoy beautiful nature and see modern cities. In South Korea you can visit exhibitions of modern art or see a performance of traditional theater, buy a new device in modern shopping mall or purchase a souvenir in ancient temple everyone will find something interesting to do. Thought Korea is a country with developed technologies, it also has an amazing nature. Everyone will just love watching Jeju Volcanic Island and Lava Tubes a natural wonder and a World Heritage Site. To see this beauty, visit Hallasan National Park. Those who prefer relaxing on a beach but close to civilization, will definitely enjoy Haeundae Beach in Busan. It is included into a list of best beaches in Asia, and this beach with a clear sand and water makes an interesting contrast with a skyscrapers on the background. learn about Korea history at The War Memorial of Korea. This amazing country has an option for everything: shopping, enjoying arts, studying history by visiting historic sites and meeting the newest technologies at metropolises. Choose South Korea as a next holiday destination, and you will definitely enjoy your stay.